As volume is rising, margins are shrinking. Dropping packages at a more central neighborhood location helps reduce delivery costs. The couriers are expanding neighborhood locations where customers can pick up parcels or drop off returns in lieu of the front-porch option.While revenue is rising as UPS and FedEx deliver more packages by truck than ever, profit margins on those sales are shrinking. Neighborhood centers are part of the effort to control the problem. Shipping companies save money by allowing drivers to drop off several packages at one spot.Consumers may be a harder sell. It’s that time of year again when online shopping surges and package deliveries soar -- along with costs and customer expectations. United Parcel Service Inc. and FedEx Corp. are emphasizing new strategies to ease the burden of rising e-commerce deliveries as the National Retail Federation predicts online sales will rise as much as 15 percent this holiday season. One big move: the couriers are expanding neighborhood locations where customers can pick up parcels or drop off returns in lieu of the usual front-porch option. 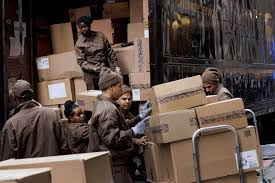 While revenue is rising as UPS and FedEx deliver more packages by truck than ever, profit margins on those sales are shrinking, said Lee Klaskow, a Bloomberg Intelligence analyst. Neighborhood centers are just one part of the effort to get control of the problem as shippers explore options ranging from drone deliveries to surcharges. The calculation is an easy one for shipping companies, which save time and money by allowing drivers to drop off several packages at one spot. Drivers often have to navigate suburban labyrinths to deliver a single box, increasing transport costs and eating away minutes in strained schedules that become especially strenuous during the peak shopping season. Consumers may be a harder sell. FedEx and UPS are both pitching the sites, which include drugstores and supermarkets, as a customer convenience that provides more flexibility and security. Adding an incentive for customers who choose its Access Point locations, UPS waives the surcharge that it’s imposed on home deliveries during this holiday season. Still, the problem for UPS and FedEx is that it’s hard to beat having packages delivered straight to your front door. It’s “enormously more convenient,” said Rob Martinez, chief executive of Shipware, which advises parcel-shipping companies. He and other experts believe home delivery will continue to be most customers’ first choice. While customers taking advantage of UPS Access Point counters are “significantly above” last year, they still amount to less than 1 percent of industry delivery volume, said Satish Jindel, president of SJ Consulting Group. UPS and FedEx are pushing ahead with programs to provide alternatives. While a lot of people may prefer front-door delivery, "there are more people who want options,” Scarborough said. U.S. online sales this year will reach more than $459 billion, up slightly from 2016, according to a report from Forrester Research Inc. Over the Thanksgiving weekend and Cyber Monday, sales spiked 18 percent from last year to $14.5 billion, according to Adobe Analytics. Those after-Thanksgiving online orders inundated UPS, delaying some deliveries early this month and forcing drivers to work longer holiday hours. UPS expects to deliver 750 million packages globally during this peak shipping season, while FedEx has forecast it will handle as many as 400 million. Sterling, analyst at Seaport Global Holdings. "It takes time to go house to house. It’s all about density." In a major expansion of its new FedEx OnSite program this year, the courier opened parcel counters in 7,500 Walgreens Boots Alliance Inc. stores across all 50 states. More than 500 grocery stores, including Kroger Co. or Albertsons Cos., also have FedEx pick up and drop off locations. UPS launched its U.S. Access Point network in 2014. Not counting thousands of sites inside its retail stores, the shipping company now has about 4,000 locations in places like grocery stores, dry cleaners and “mom-and-pop” merchants. Of course, to have any significant impact in easing margin pressures, “The adoption by consumers is pretty important for those to be successful,” said Bloomberg’s Klaskow. Customers who direct parcels to the sites must show identification to collect their package. Parcels are held five days by FedEx Onsite before they’re returned, and seven days at UPS Access Points. Customers must pack and label packages before dropping them off. Young adults, especially those needing to return an item bought online, may lead the way in using the alternative sites. About 30 percent of e-commerce purchases are returned, FedEx’s Scarborough said. A recent study by Narvar Inc., which advises companies on online customer service, found 41 percent of those under age 30 expressed interest in using a nearby location like a grocery store for returns. When all ages were included, it dropped to 28 percent. During the five-day shopping period over the Thanksgiving holiday, shoppers in their mid-20s to mid-30s were the biggest spenders in stores and online. Members of that age group shelled out $419.52 each on average for gifts, or 25 percent more than the average shopper, according to a National Retail Federation and Prosper Insights & Analytics survey. To get wider adoption, two key things will need to happen, said Trevor Outman, president of the consultant Shipware. Shippers such as FedEx will need to include the feature prominently on their websites, and the option needs to be easy enough to use that it truly will add convenience for customers, he said. "The adoption in the marketplace is to be determined," Outman said. "But you can count on the carriers pushing for early market adoption."